Aside from using my Compact on duo gigs, I also use it every 4th of July. I put on a fireworks show at the cabin and use the Compact for the music behind the fireworks. It's awesome! I don't even use the extensions...just plop it on the picnic table, plug it in, plug in my iPhone with the pre-mixed mp3 and BOOM! Ohhh Say Can You See....You can even hear Whitney thru the fireworks! SaWEEET! Now that fireworks thingy is a cool idea! I'm going to do that this 4th! I do location recording for classical musicians, i.e., we go to the Steinway or the pipe organ or to a certain hall or auditorium a vocalist wants to be heard in. I bring along a Compact, no extension, and use it as a playback monitor. It just sits on the floor beside me. The sound of the playback is so true and clear that my clients ALWAYS comment about it. Twenty-three pounds of amazing sound! There is no gathering around a near-field monitor, they can hear it well from 40-60 feet away! I could not do this with a normal PA-type speaker, although I think a JBL might be the best of the bunch. All the others suffer from coloration, directionality and lack of clarity. The sound from the Bose simply fills the air and everyone hears the same sound wherever they are. We found another use for the L1 Compact last weekend. My wife/keyboard player is our choir director and for our church's Christmas concert the choir is up in the front of the church across the sanctuary, spread pretty far out. My wife plays the Clavinova in the center aisle facing us. In years past, I put a Fender Acoustisonic in front of the piano but those off to the sides had trouble hearing clearly. I put the L1 with no extensions on the floor in front of the keyboard, and problem solved. I love this thing! Thanks for telling us about this application for the Compact. It's hard to beat the extremely wide dispersion. Is the piano on an elevated stage? I'm wondering about the position of the Compact relative to the listeners' ears. I direct a high school choir. For Christmas, we did a cantata with an adult community chorus. We had around 140 singers. Our stage has steps to the pit which we use as risers. 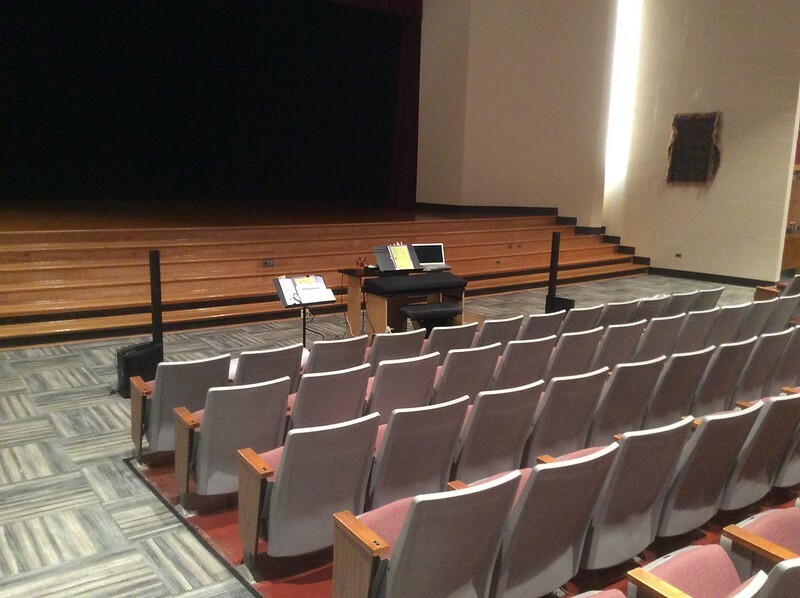 That gives us four rows and I added choral risers to the stage level to give us a total of seven rows. The auditorium seats 525 and has EXCELLENT acoustics. We were singing with recorded accompaniment. I put my two L1 Compacts in the pit with one extension each. They were placed facing each other, 90 degrees to the audience and choir, each one third of the way in from the edge of the choir. They ran only the tracks, the soloists were mic-ed through the house system. My theory was this: The L1s offer 180 degree coverage, so audience and choir could both hear. Having them face across each other would cover the areas behind each. As director, I had a very good indication of the balance the audience was hearing. It was very much like have a live pit orchestra in terms of balance and blend. The best part is, a recorded orchestra can play softer than a real one when needed! It worked great! Used the idea with a children's choir, different room, all kids on stage risers. Placed the compacts with no extensions, also worked well! That's a really interesting application of the theory (good theory). Did you happen to get any pictures? Thought about taking photos, didn't get a chance. I forgot to mention - I had the output on the compacts set to about 50%. That gave me plenty of headroom that I could boost the output on the tracks if needed when the choir was singing full voice. The 2 together put out more than enough sound for the entire room. As I said, this auditorium has excellent acoustics. There's a sculpted drop ceiling that focuses sound back down on the audience. Another musician in the community was part of the adult chorus. He had never seen an L1 system before. He went out and bought a Compact after the concert! Been watching this forum for a while with keen interest since back in 2012 when I bought my first Compacts. I originally bought them for small DJ events as well as wedding ceremonies etc. But then I put them to the test in my audio video production company where I handle the AV for medical seminars for Englewood Hospital in New Jersey. They have a gorgeous 350 seat auditorium in the hospital where there are frequent events. After experimenting with placement I have been using the compacts to rave reviews from the audience and the doctors alike. Even the hospital president was astounded at how good they sound I had him mic'd using a shure headset, zero feedback, excellent dispersion and somehow the way I have the compacts positioned they couple with the stage and give me a ridiculous good bass response I actually have to tone it down with the EQ but the sound is unequaled. I run the sound and video from the rear of the auditorium I have the speakers connected wirelessly using Line 6 transmitters and receivers which works excellent. The compact is a great product when used properly even going way beyond expectations. One of the senior doctors even commented that he thought he was sitting in his living room listening to the presentation and when I play pre-and post event music everyone raves at how good it sounds, as if the band were actually on the stage. Kudos to Bose keep up the good work. 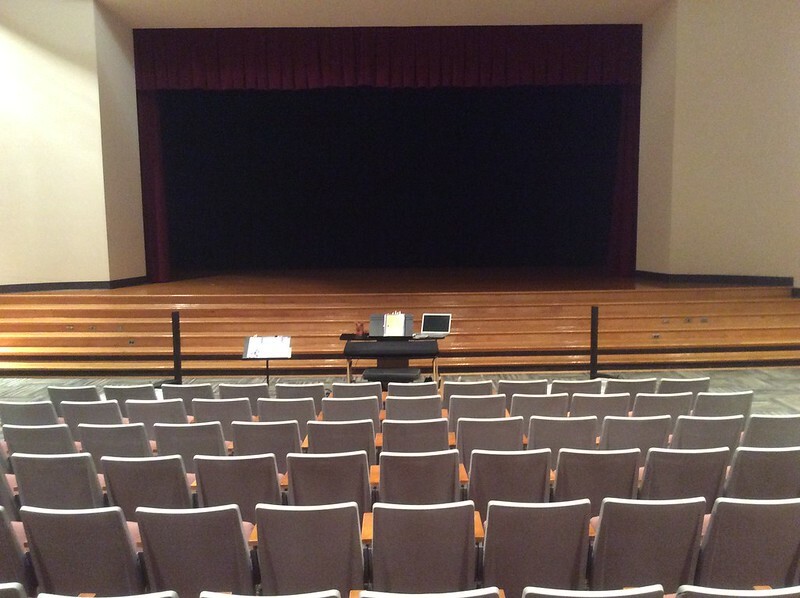 Here is a picture looking at the rear of the auditorium with my AV set up on the right side. Thanks for the pictures and story about the room. That room looks like it was designed for sound. It's great that you've found a way to get the Compacts to work so well for you in there. Is there no house system? How does it compare to the Compacts? The house system is the curved rectangular panel above the stage. The Bose absolutely blows away the house system which is why I get called on to do the AV for the important events. I actually take great delight in pushing the boundaries of what the Bose can do, and so far it has handled everthing I've thrown at it. I also own 2 L1 model 2's and have B1 & B2 subwoofers. Below is a pic of a recent off site medical seminar I did at the Ocean Place Conference Center in Long Branch, NJ. The attendance was 1500 people, this is not a typo!!!. I used 2 L1 w B1's placed about 50ft apart on 2 ft risers on the long side of a 120ft x 70 ft room. All I can say is WOW!. Nothing but compliments the whole afternoon. Speech and music were heard clearly everywhere in the room. Great dispersion and even SPL and no feedback with only minor tweaking of the eq. Bose has been by far the best business decision I've made for both my DJ and AV production business. I've also had great success doing Sound Reinforcement for Live Bands, but I'll save that for another post. I remember our conversations when you first joined the forum. It's nice to see that you are doing so well. I am thinking of buying two L1 Compact systems, and to link them to my existing Alto ****** ZMX124FX, 12 channel mixer for performances by my 4-piece band (3 mics + 3 instruments into the mixer). Gigs are at small venues with a maximum audience of 150. Presumably my mixer can be used to “drive” the two Compacts? Also, when not being used at gigs, can I use them with my stereo system at home? I have an Arcam Mini Solo that currently “drives” a pair of Celestion Ditton 66 speakers. It would be good to be able to add the L1 Compacts to my home system. I have been the proud owner of two Compacts for about 4 years now, and they have been a great investment. I have tried to figure out if I'm hyping myself about the sound or not, but it never fails that people always remark at how good they sound. Great, actually, is the word that is used most often. Other highly touted traditional PA speakers simply don't have the same clarity to my ear now that I'm used to my Bose. I don't know what kind of music you play, but people these days show up with two satellite speakers with 15 inch woofers and they still bring along a subwoofer or two! We live in a bass heavy time. If you need to, there is no shame in supplementing the sound of two Bose compacts with a subwoofer of some kind if your music demands that. I do, but only if I'm playing a dance music DJ type gig. You need to try it with your setup first before you decide. It has good, clean bass; it's just not a 500-watt sub. If you have a bass player, they need to bring an amp and balance their sound to the mix, IMO. Compacts are neither bass amps or subwoofers. This is not a failure of the Bose compact system. It is simply admitting that it is what it is, and what it is, it does very well. It was designed for a solo singer with an acoustic electric guitar. I do gigs like that and it is absolutely superb. The fact that we can take two of them and make an excellent small venue PA is remarkable! They make a great stereo system! I also use them as a stereo keyboard setup for my B3 emulation synth, which sounds totally awesome. My best advice based on my experience with Compacts is you need to give them a good solid input signal in order to get the loudest and clearest sound out of them. If you send a wimpy or underpowered signal to a Compact it will not sound at its fullest potential. Proper gainstaging at the mixer is also crucial to getting the best sound you can. Forgive me if you already know all this. I just feel that it has to be said. It's a different thing than the usual PA brute force approach to getting a sound out there. I think that's why some people don't get the Bose concept of amplified sound. But it never fails that the audience "gets" the Bose sound because they have continually told me how much they love it! I've never had anyone come up to me and say, "Gee, if you just had a (name) PA this would sound so much better." Never. And the coolness factor you get from, "You're getting all that sound out of those little things," never gets old, either. Reliability has been great and the mating connectors on the extensions have been solid. I love the covers and the overall build quality is excellent. Best of luck in your all your musical pursuits! Thank you JazzSinger1954. Wow, that is a very thorough reply. We mainly play 50's/60's/70's pop music for small dance venues, pubs, restaurants etc. The format of the band is guitar, bass and keyboard (each with their own amps), together with acoustic drums (no amplification needed). So I take your point regarding the addition of a subwoofer. Which model do you use? My thoughts are to "line-out" (or Mic) the 3 amps together with 3 vocal mics into our 12-channel mixer, and to then feed the mixed signal into the 2 Compacts in a conventional PA system manner. I would then like to use the Compacts to their maximum output needed for the venue and, if necessary, use the 3 instrument amps to supplement the overall sound. I hope that makes sense! Alternatively, I could use our two existing Alto TS 115 active speakers to supplement our sound levels when required. When you say they make a great stereo system, do you mean in the home stereo sense? As this is what I would wish to use them for when not gigging. Again, many thanks for your help and advice. I have started a new discussion for you. I own 2 Compacts. For small single Compact gigs, I like to use either a Sennheiser e835 dynamic or an AKG C1000s with the nine-volt powering it plugged into the XLR. My guitar is a Yamaha Compass series plugged directly into the 1/4" using the Line setting, not the tone setting. For me, the Yamaha just sounds better without the tone modeling, your mileage may vary. I use backing tracks on my phone or on a Sanza fuze plugged into the 1/8" input. Works great. I have had very good results recording my performances from the 1/4" output, too. For bigger gigs, I use a VoiceLive2, in which case I plug my mic, guitar and backing tracks into the VL2. Then I run two TRS-TRS cables from the VL2 left and right outs into the two Compacts for stereo playback and effects. Super awesome! There are so many excellent Bose experts on this forum, I'm sure you'll get every question answered very thoroughly! Best of Luck to you! Glad you found my response helpful. There are so many really excellent Bose users on this forum who have helped me in many ways! As for the home stereo application, I must say that one deciding factor in purchasing a Bose system is the fact that it SOUNDS like a really awesome home stereo system and not like a typical PA-type sound system. I always liked the Clair Brothers sound because, back in the day, they took a whole bunch of woofer-tweeter speaker boxes and just piled up a bunch of them to make the PA. I heard Elton John with the Clair Brothers doing sound and it was so great. I always described it as "like a really big, really awesome sounding home stereo." That's the sound I like and that's what I get from Bose. OK, more history lesson. Today, things have gotten louder and louder and bigger and bigger. We no longer have a single mix onstage. We have the Front of House (FOH), the backline of actual amp, guitar and drum sounds, and the monitor mix, which has become the in-ears mix and is even more isolating. The Bose concept, IMHO, is to get back to the days when a band could actually hear their music as THEY play it and they mix themselves as an ensemble, rather than having their own individual mix completely separate from the FOH mix. I think your band would be very happy if you (1) place the Compacts behind you (2) run mainly vocals (80%) with a small amount of band mix (20%) in the Compacts, and (3) have your drummer and the amplifier levels "mix themselves" to the level of the vocals. With Compacts in the back, everyone will hear the vocals clearly and it will be obvious how loudly the band can play based on hearing that vocal level. I guarantee you that everyone will be talking about how good you sound as a band. Just using the Compacts as your main source for bass, keys and guitar will not be satisfactory and will be no fault of the Compacts. You will need to invest in the larger, more powerful models with B2's in order to do that. But, if you go with what I've suggested, using the Compacts as your main vocal speakers and mixing the amplifiers and natural loudness of acoustic drums to that vocal level, you could be very happy with the way it sounds. I mean, how many bands have you heard who played great but the vocals were drowned out by the instruments? Playing 50-60-70's music like you guys do, vocals are THE most important thing. This example might not be a good one for your situation, but here goes. I was doing a Christmas gig as a solo singer with a large jazz band (18-20 pcs). 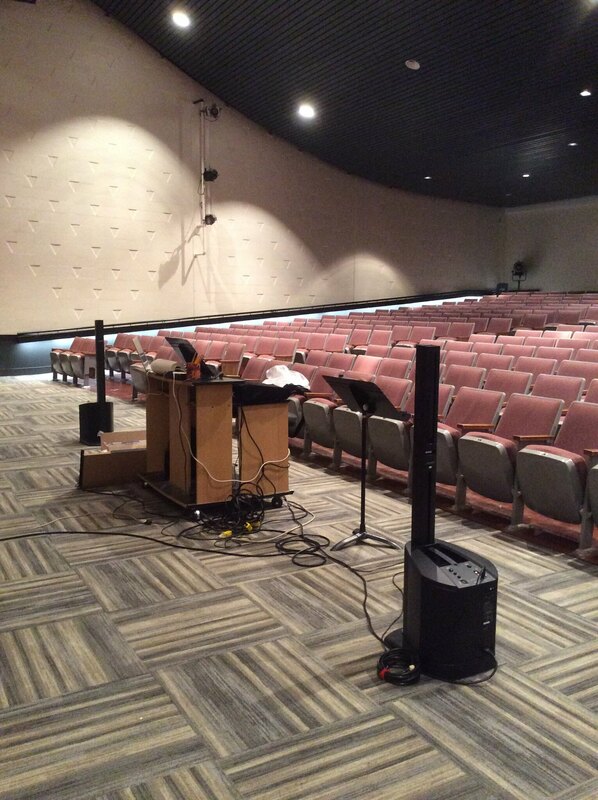 The medium-sized venue had a Mackie system, with a 15/horn box and a 15" sub on each side. I setup my two Compacts behind the band about 40' apart and just ran my mic through it. The house engineer had the band mic'd up through the Mackie system and said, "OK, let's hear what it sounds like." We did a big, loud number and he said, "That sounds GREAT. I'll just mix the band TO the vocal and that will be great." That's what he did and everybody loved it. Even the trumpet players (!) said it was great because they could really hear the vocal and play to it. All of this is really predicated to the volume level you need to run for your gigs. The way I figure, bass, keyboard and especially guitar players love to play with their amps a little pushed up, ya know? So, why not do that, enjoy it and let the Compacts make your vocals sound like you're in a recording studio! Hello again Jim, and many thanks for all of your advice - all very interesting and very useful. Needless to say, we will follow your recommendations, and experiment with the various sound inputs, but concentrate on getting the mic levels correct first. Again, many thanks and best wishes. We're getting ready to do a production of Aladdin with recorded accompaniment in the pit. This time I took photos! Let's see if this works (images from post above). I hooked up my L1 Compact to my Sony PS4 via an optical-to-analog converter. Now I can play Rocksmith with a very minimal delay between the time I pluck my strings to when I hear the sound. It's amazing what migrating to a new platform can do. Re-read a few older threads etc. This is basically something that ST mentioned in the Kemper thread which I tried out and was blown away by. Using the Compact as the main amp for a Kemper Profiler. The sound is absolutely amazing and the guitar can be heard everywhere in the room with the same clarity. In fact a friend of mine who works as a recording engineer had heard that I've got a Kemper and asked if he could try it out. I asked him to bring one of his own guitars (so that he had something familiar to play). I set up the Kemper through the Compact with 1 extension and when he chose a Profile of a familiar Amp he was really impressed with the sound. Walking around the room and having the same sound everywhere he stood was what really blew him away. No single "sweet spot" as with a real amp (plus it being extremely loud when using overdriven sounds), but the same studio clarity everywhere in the room at a controlled volume. He'd thought he'd come, play for a few minutes and that would be that. What happened was that he played for more than 2 hours and only left because he had a prior engagement. Kemper Amps use L1 Model II systems at different shows around the world (Namm, Frankfurt) to amplify their gear, but a Compact (without extension roughly 11 kilos + 2 kilos for the extensions) and a Kemper Profiler (around 6 kilos) make an awesome guitar rig. For anyone looking for something to amplify a Kemper (or probably any modeling Amp) I can recommend the Compact. With a Kemper it's awesome and with it you have a rig that won't break your back with the Compact being the heaviest single part and only weighing in at around 11 kilos. The built in effects of the Kemper should be enough for most guitarists. I use the Kemper Remote (foot controller which weighs just under 5 kilos as it's all metal and built like a tank) to control the unit and can connect up to 4! expression pedals (for effects control) to it. I hope that this has been of interest/use to some readers. For two years, I have used the L1 Compact to amplify vocals during my SMALLER fine dinning events. It's great equipment for vocal. I do not mic my tenor and soprano saxophone, because it sounds horrific (I understand that it was not engineered for that type of application). It amplifies vocal great for 50-100 people that are eating and NOT speaking. If they are drinking any type of alcohol and talking, the Compact can serve about 25-50 people max. It is a lovely system for small gigs..
Great for small karaoke gigs to...! Maybe it will make someone smile in times where many feel that they have to go down into the basement to laugh. It reminds me a bit of ST's Avatar before the F1 joined the ranks. In case anyone's interested, the guitar is a Taylor T5 Standard in a black gloss finish. I wanted to use the L1 compact with a midi accordion, 2 vocal microphones and 1 sax microphone in a small venue. Will the midi bass be heard. Haven't bought one yet but want to trade in my 42 lb. monster as long as the L1 compact is capable of handling the above.